Top organizations are improving both customer loyalty and profitability by creating consistently positive experiences for their customers. But many new ideas are emerging for how to create both unique and superior customer experiences that make a difference. 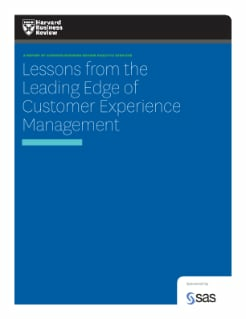 This Harvard Business Review research paper examines how forward-looking organizations take a strategic approach to the customer experience, including how to design, implement and manage the customer experience in a disciplined way; overcome channel and data challenges; and develop best practices around customer understanding, measurement, design and strategy.